In Mark 2:23-28, Jesus and his disciples are criticized by the Pharisees for plucking grain to eat on the Sabbath and thus doing “work”. Jesus admonishes them with an example of how King David and his men ate holy bread from the tabernacle, even though this was in direct contradiction to Leviticus 24:5-9. If David could do this to satisfy his physical needs, then surely Jesus, the “lord of the Sabbath” (v. 28), would be morally justified in allowing his disciples to satisfy their physical needs in a grain field. Why was Jesus angry? Because the Pharisees did not observe God’s law for the right reasons, but to highlight their own (pitiful) “righteousness”. There could be only one reason that the Pharisees would seek to accuse Jesus for his astonishing miracle that day: because they wanted to protect their own useless traditions, which had no spiritual significance and only served to bolster their pride. Time and time again, Jesus condemned the religious establishment for this hypocrisy (just look at his rebukes in Matthew 23). Bible scholar Warren Wiersbe equates Jesus’ actions to “declaring war on the religious establishment”2. 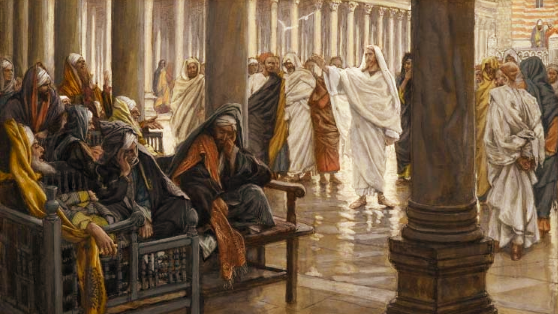 Before we smirk at the Pharisees’ behavior, how often are we like them? How often we read the Bible and pray just because we “have to”? How often do we criticize other Christians for not following a set of rules and regulations? How often are we so caught up with how right we are that we forget to love even those whom we disagree with? How often do we grudgingly come to prayer meetings or church services just to show others how faithful we are? Remember that Jesus hates it when we do these things. In the Bible, he never minces words when it comes to criticizing the false pretense of religion. We may serve and worship God, but until we can rid ourselves of merely “practicing religion”, we are only “having the appearance of godliness, but denying its power” (2 Timothy 3:5). MacArthur, John F. MacArthur New Testament Commentary. Moody Press, 2015. Wiersbe, Warren W. The Wiersbe Bible Commentary. David C Cook, 2007. Amen!! What joy we can have when we realize the true liberty found in our salvation. Like it. Will try to remember this when I serve in the church. Thank you! And I agree – this is something for all of us to remember. Strong start to the series. Love it. Blind guides, hypocrites, whitewashed tombes – Jesus did NOT mince words with these guys. So important to remember how anti-Jesus we are when we act like this ….